Jacquelyn Cavish will trace her transformation from a spirited tomboy in the hot climate of Tucson to an accomplished painter of maritime scenes. Dedicated teachers early in her life helped create a woman striving for quality and finish. She studied ceramics at Cal State University, Fresno and earned an MFA degree at UCSB. Yet it was a class at Ventura College with Hiroko Yoshimoto that gave her a solid foundation in the use of watercolor. A founding member of the California Gold Coast Watercolor Society in 1991, she was a longtime active supporter of the Oxnard Art Association along with Joanna Steele of the Studio Gallery in Oxnard. Joanna has supported and represented Jackie’s art work since 1985. 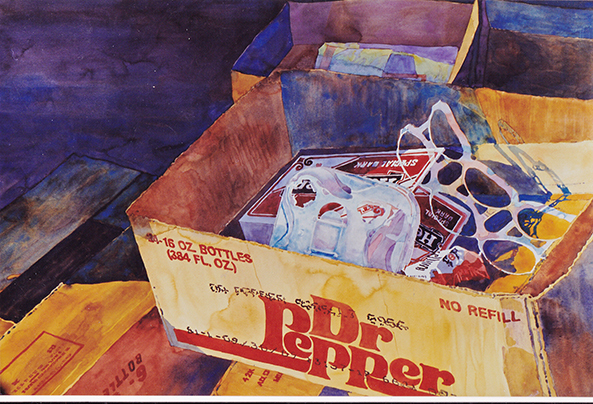 In the 1990s the artist worked exclusively in watercolor, painting images of local shop windows, the harbor at the Port of Hueneme and the surrounding vegetable fields of Ventura County. Over a period of several years she has produced a series in oil paint of views of La Jolla Canyon along Pacific Coast Highway and she attended a figure drawing group led by James Menzel-Joseph that meets weekly at the Ojai Art Center. Today she teaches art history at Oxnard College where her students describe her as “awesome” and “the best instructor.” She was a Curator of Art at the Ventura County Maritime Museum and mounted exhibitions on the work of renowned maritime painters including Thomas Hoyne (1926-1989) and David Thimgan (1955-2003). Her favorite exhibits and greatest challenges have been Submarines in the Age of Sail and When China Ruled the Seas. She is currently part of the team to design new exhibits for the maritime museum’s new site and she continues to pursue a passion for art making. The archive has extensive information about this artist. Sponsored by John Brent Wealth Advisors, John & Cherie Brent and Old Broads Moving Company.